Mr. P was a slave owner who after his conversion, started a Christian church in his home. You may find it odd that Paul never expressed any opposition whatsoever to the practice of slavery which was prevalent in the Roman Empire at the time, neither did Jesus. You may also find it strange that Mr. P continued being a slave owner even after his conversion. Keep in mind that, even today, it is society which dictates what is or isn’t acceptable. In the future, however, when Jesus sets up His one thousand year kingdom on earth, (The Milennium) things will be very different than they are today. Here’s the favor that was asked: One of Mr. P’s slaves ran away and landed in the same prison where Paul was incarcerated. His name was Onesimus. Subsequently, he too was converted to faith in Christ through Paul’s teaching. Paul soon convinced him to return to Mr. P., but not without the letter where he asked Mr. P to receive him, not just as a slave anymore, but now also as a brother in Christ. Being the man who brought Mr. P to his salvation in Christ, Paul sensed that he was in a position to ask such a favor. In the letter, he also included this plea: If he hath wronged thee, or oweth thee ought, put that on mine account, (verse 18 KJV) or as Daffy Duck might have juicily said, “Put it on my bill!” (Sorry, I couldn’t pass up on that one) It is believed that Mr. P complied with the request, remembering the he too had been graciously forgiven. I have a favor to ask too. Perhaps, one or more of you who are reading this blog today have had an unpleasant experience with a loved one or friend, resulting in a painful estrangement. Yes, I know you may have been the victim the same as Mr. P. was. Remember this, though: Nobody can offend us any more than we have offended God in our lifetime, yet He forgave us and lovingly took us back in. 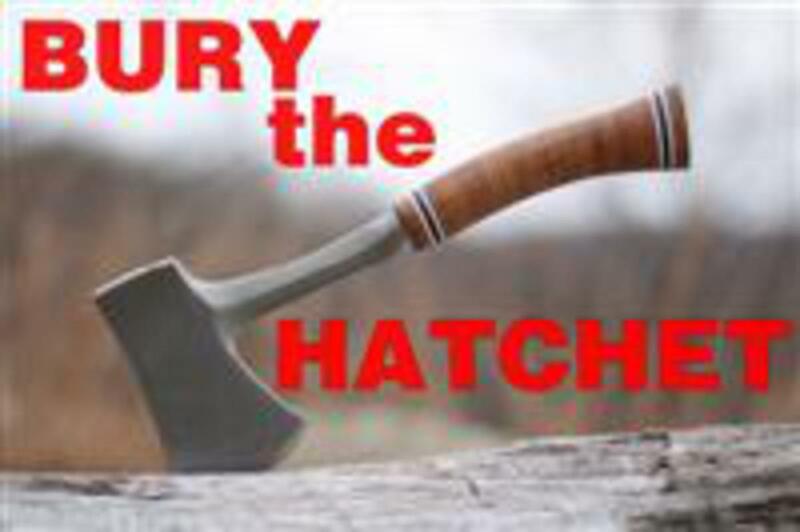 Could this be your time to “bury the hatchet” and then forget where you buried it? Do it for the offender; do it for yourself. More importantly do it for the One who loves you the most. Memory Verse for the week: (1 Peter 5:7) Cast all your anxiety on Him because He cares for you.